Why you should use StockEdge App! We want you to spend minimum time and earn maximum. 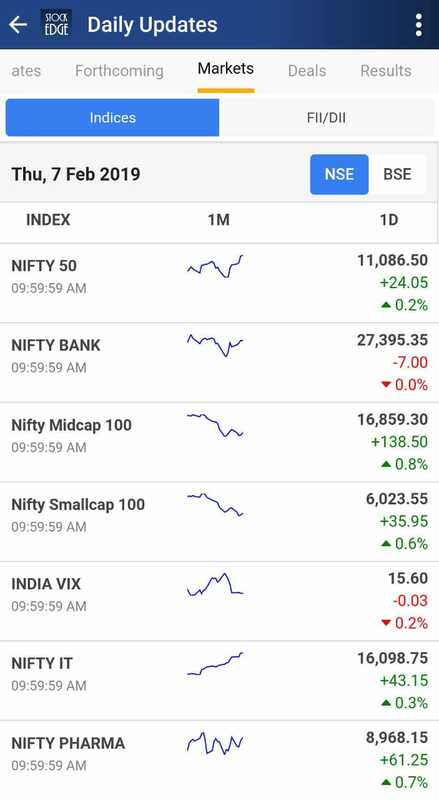 Spend 15 minutes daily before the market opens to know about the important happenings of the market via Daily Updates section. 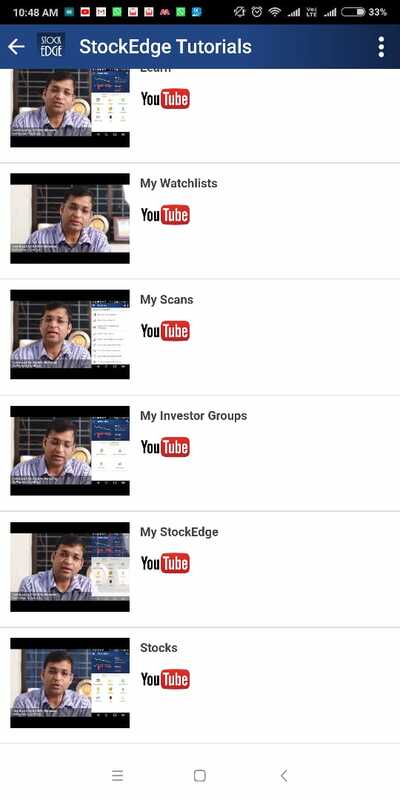 StockEdge is an End of the Day Analytics app, we do not give any buy/sell signals or calls during the day. We have created a soundproof ecosystem by providing you filtered information in the form of news, major events affecting the markets, important bulk block deals etc. All these are available under Daily Updates Section of the App. 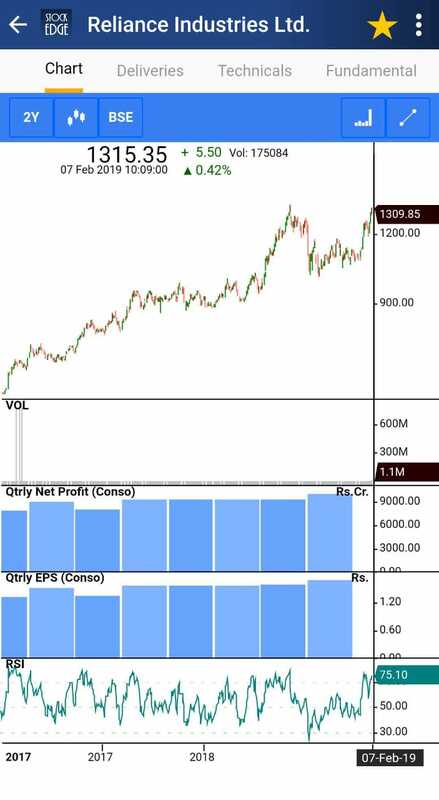 If you want to do a detailed study of any individual stock, search it from home screen or Stocks section. 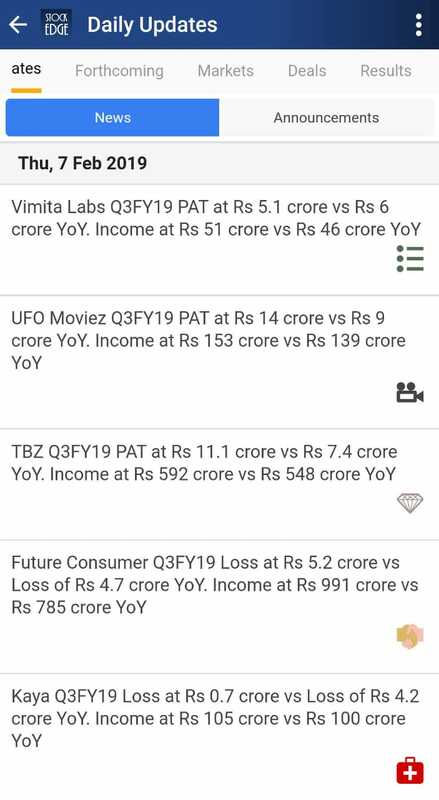 You can access all the important information about the stock like chart, technicals levels, performance, bulk/block deals, Fundamental overview, results, ratios, balance sheet, cash flow statement, Corporate action, News, conference call, investor presentation files and much more all with a single swipe. To know about the overview of the market, Click on Indices where all the major NSE and BSE indices are available with respective components and their gainer and losers list. 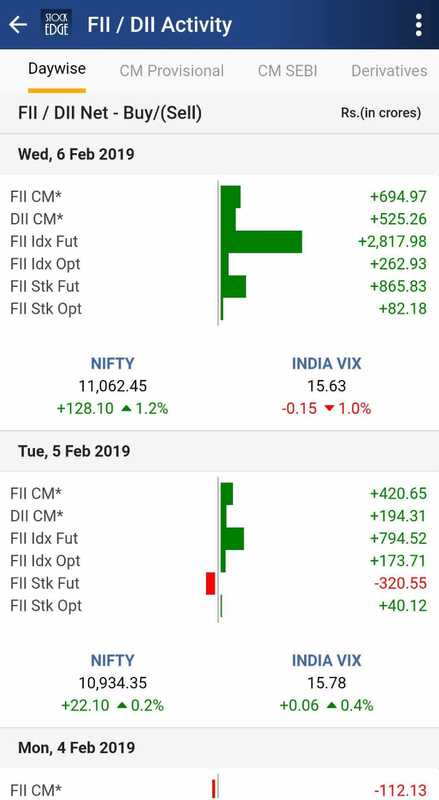 FII & DII play a very important role in deciding the flow of the market their daily, monthly and annual data is presented in the most simple way to help us remember their buy or sell position. Bulk, Block and Insider Deals are important as these deals impact the share price and are done in huge quantity. In StockEdge App you get filtered deals which are important for you in the most simple form. When you are done with your office spend 30 minutes after 7 pm to prepare yourself for the next trading day. 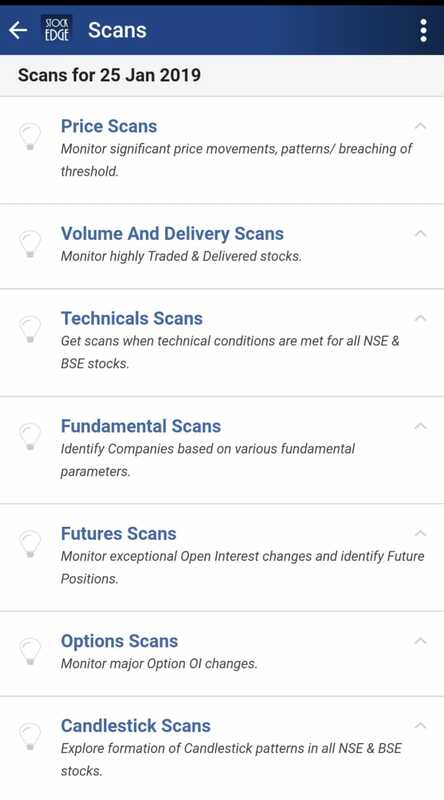 Scan is a unique feature of StockEdge, which has been created to save your time and effort so that with the click of a button you can identify next days trading opportunity these are updated daily at the end of the day around 7 pm. 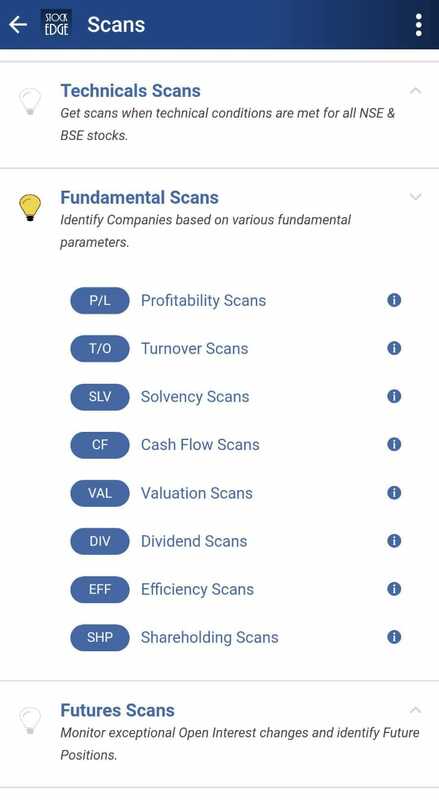 There are more than 200 technical scans including SMA, EMA CCI, RSI, MFI, William %R, ROC, MACD, ADX, ATR, Stochastic, Parabolic SAR etc and more than 150 Fundamental Scans including profitability, sales, EPS, ratios, shareholding etc. We have 2 dedicated sections in the App: LEARN and StockEdge Tutorials. 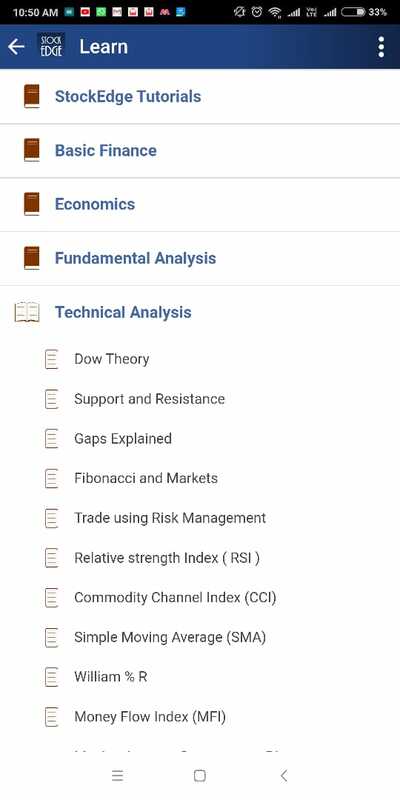 These sections guide you on the basic topics of the Stock market along with videos on how to use them in App. 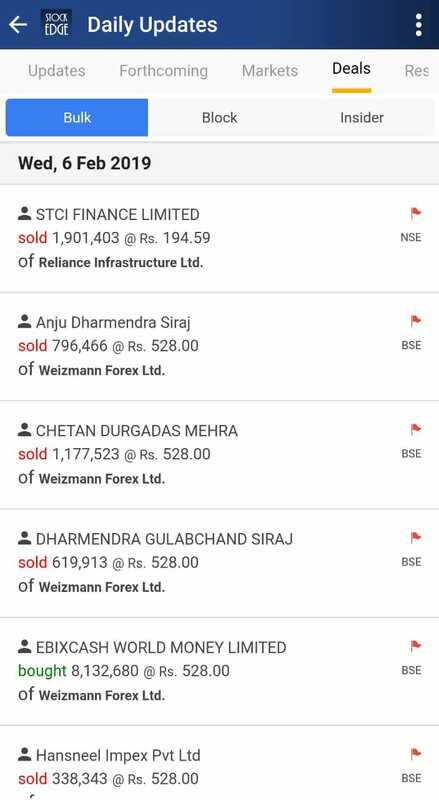 For investors who like investing in an IPO, there is an IPO section, where you can study all the details of upcoming IPO along with DHRP and also performance of all the listed IPO in the same section. This section is created for you so that you can personalise the app and see just what you follow. My Watchlist: Create 50 watchlist and add stocks that you are tracking, somebody has recommended you, or you already are invested in etc.. 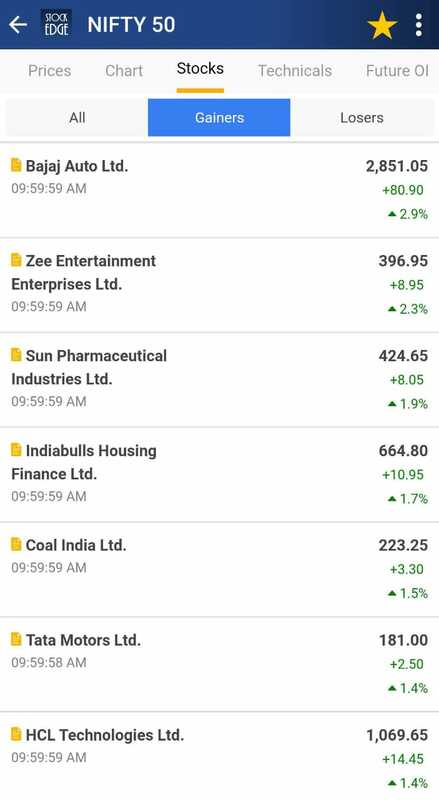 The best thing is that you can track the performance of the share since the day added in the watchlist, along with scans, news, updates, deals all you need to know relating to the stocks added in your watchlist to help you take buy sell or hold decision. 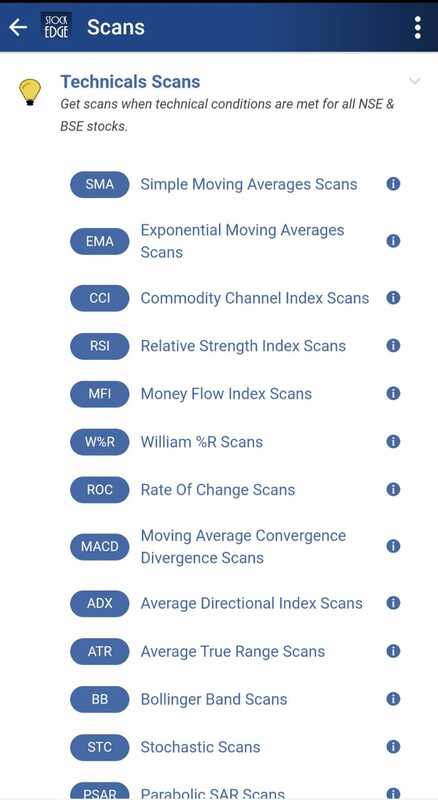 My Combination Scans: With Combination Scans, you can combine one or more fundamental or technical scans (up to 10 scans per combination) and generate the list of stocks that satisfy all scans from a given combination. This feature will help you to identify stocks as per the trading strategy that you follow. 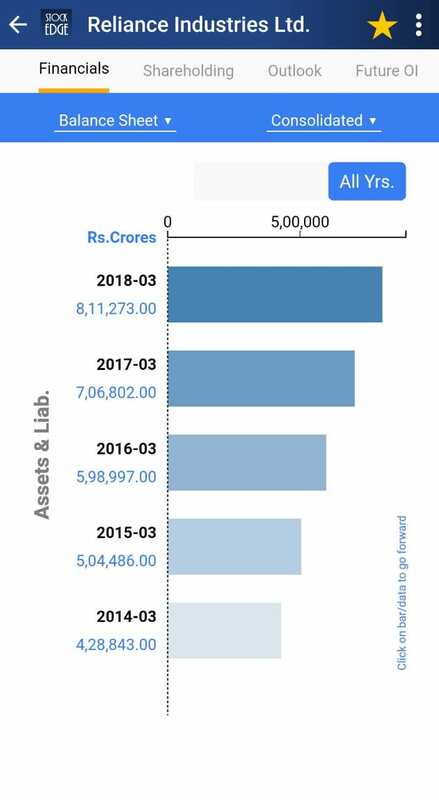 My Investor Groups: Create portfolio’s of 50 Ace Investors like Rakesh Jhunjhunwala, Dolly Khanna, Porinju Veliyath, Vijay Kedia, R K Damani and many more and Start following and learn from their investing style. My Scans: Add 50 scans as your fav from a list of more than 300 technical and fundamental scans. To Advance your research further Premium section will take you ahead of all your peers and help you improve your market understanding. 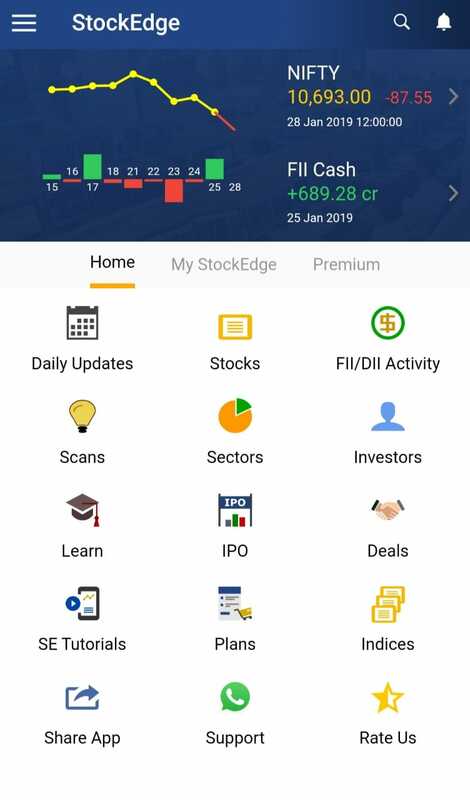 StockEdge is the only App where you get in-depth knowledge, information related to 5000 Indian stocks displayed in the easiest possible way thus making the user experience a delight. 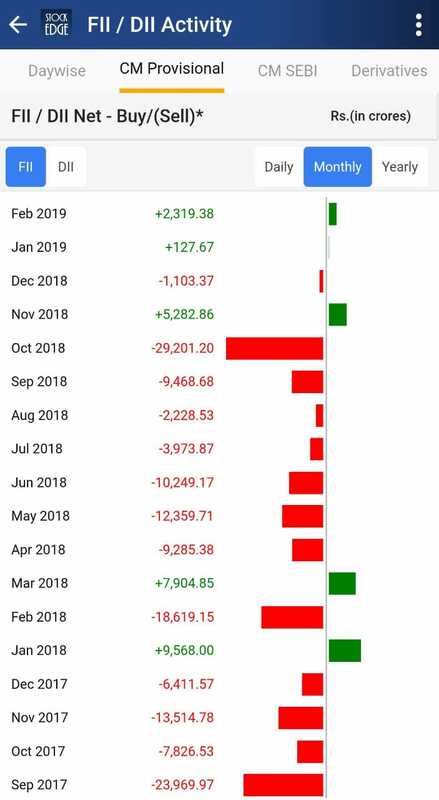 Few days back I received invite from you to join stockedge club like that and was asked to fill a online form but was not able to do so because of internet problem…can I join the club now? Yes surely Sir, you can become a club member now. You shall receive a call shortly. Hello Sir, Can you please share your contact details so that someone can call you. I really appreciate your app. I have been in a stock market for a long period, but I have found your app. recently in goggle play store. 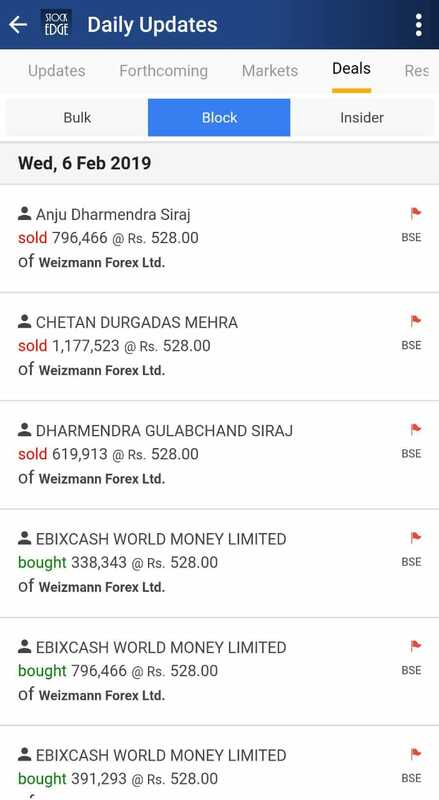 So many players in the market , nobody have explained like you about an indual stock in 360dgree angle. I really very much thankful to you for the application. Just from last week only I am following the stocks pivot level, support level and making a little probit from that levels.